The word "periodontal" means "around the tooth." 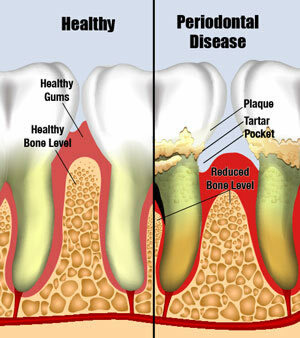 Periodontal disease (also known as "gum disease," "pyorrhea" or "periodontal infection") is an ongoing bacterial infection in the gums and bone around your teeth. This infection leads to an inflammation under the gums, and if not treated, this inflammation can destroy the bone around your teeth. This results in tooth loss. Approximately 75% of all adult tooth loss is due to periodontal infection. They were friendly and professional with excellent care. They made a scary event so much better. Being born in the 40's dentist have not been my favorite people but you guys have changed my mind. Thank you.